The minutes of the first few years of the existence of the Radnor Baptist Church make entertaining reading, not only as the history of the founding of one of Wayne’s early places of worship, but also in the insight they give into what might in these days be considered the private lives of the members of the congregation. In the 1840’s there was seemingly little privacy in the lives of any one connected with the church. At a business meeting held on January 20, 1848, one of the matters under consideration was “a charge preferred against Sister T. for accusing Brother M. of swearing and telling lies”. Later Brother L. “was appointed to visit Brother M. to investigate these charges.” Then the committee in charge of looking into the case reported that they have been informed that “the charge of swearing was true, but did not know that lying was included.” Then Sister J. and Sister B. testified that “they too had heard Brother M. swearing.” By May a committee of five was appointed to meet Brother M. and his accusers “at the school room on Saturday evening at 6 o’clock.” It would be interesting to know the final outcome of Sister T.’s accusation. But by June the case against Brother M. was “indefinitely postponed” when “accusation failed to be made out”, even though Brother M. “was called up through the committee.” In all the matter of Brother M. was before the church some six months. That committee was dismissed after making its report and another was named “to labor with Brother B. and endeavor to bring him to see his error.” This second committee reported that he Brother in question “drinks as a medicine.” They requested him to “attend Church Meeting, and he thought he would.” Whereupon the second committee was discharged. The minutes of church meetings for some months after that report that “the case was laid over.” But, finally “Brother B. being present, made a statement of his views and feelings to the church, and on motion was restored.” Whether he was permitted to continue “to drink as a medicine” is not quite clear in the minutes, however. Apparently the committees in the end always obtained the answers they had been appointed to seek out! Brother A. said he did “forgive the offense, but still requested his letter.” This the Church did not see fit to grant, “deeming his reasons for leaving as insufficient.” However, Brother A. persisted to the point of finally obtaining his letter. Personal difficulties were not confined to members of the Church, however, After serving more than three years as its minister, Brother Hobart tendered his resignation on the grounds of “diversity in the views entertained by some members of the Church and myself.” He also stated that “duty requires that I should provide for the wants of my family and pay my honest debts.” And he does not see that he can do this “under existing arrangements.” Apparently even as long ago as the 1840’s a yearly salary of $350 was not enough to support a family! For although Brother Hobart had asked for an increase to $400 the second year of his ministry, he had apparently never received more than $350. And even this amount had been hard to obtain by solicitation from members of the Church, as various notes in the minutes bear witness. The situation came to such a pass in the matter of arrears in the minister’s salary that those who could not show good reason for failing to meet their pledges could be suspended from membership. Apparently the early years of the Radnor Church were difficult ones for all concerned. The Church Covenant o the Radnor Baptist Church, written in February, 1841, shows members of that denomination to have been not only a deeply religious group of people, but very strict in their mode of life. The Sabbath Day was to be observed as much as possible in holy worship by “avoiding all unnecessary work or visits”, or the “reading of political and wordly newspapers” or “engaging in casual conversation”. And equally clear is the church rule of temperance which states, “We also agree that we will not use intoxicating drink ourselves, nor traffic in them as a beverage . . . We will not provide hem as an article of entertainment or for persons in our employment and in all suitable ways we will discountenance their use throughout the community”. Later in the Church’s letter to the Central Union Association, the members further amplify their stand in the matter by stating that the practice of slave holding is “Directly at war with the precepts of the New Testament which commands us to love our neighbor as ourself, and to do unto others as we should that they should do to us . . . therefore we cannot feel free to receive to our communion as a Christian or Christian minister a slave-holder or an apologist for the systems of iniquity”. This matter was evidently one of deep concern to the church for some months after this letter was written a lengthy preamble and resolution couched in no uncertain terms were presented by Brother Hobart, minister of the church, and adopted by the congregation. Because slavery permits every crime known to the laws of God and man, and sanctions the most enormous outrages upon virtue, humanity and religion, that have ever marked the region of tyranny or the dark spirit of religious persecution” certain resolutions were adopted. Among them was one stating that the Radnor Church could not recognize as “a gospel Church” any that numbered slave holders in its membership. Another was that the church deny membership or communion to those known to be slave-holders “either in theory or in practice”. And almost needless to say “no minister known to be guilty of the sin of slaveholding” was to be permitted in the pulpit. From this it seems obvious that the account was written after the Civil War which occurred some years after the new church was founded. At any rate, “As long as Mr. Fletcher continued Pastor of the Great Valley Church the anti-slavery element had a warm friend and faithful adviser, but he was called upon to leave us, and the man who succeeded him was his opposite, strongly pro-slavery. To show his knowledge of Bible lore, he quoted Scripture to show the rightfulness of slavery, his denunciations of the Abolitionists were greatly relished by the pro-slavery element, and many of them thronged to hear him denounce the erring friends of humanity . . . The inference from this informal account of church matters back in 1841 and even before, seems to be that a difference of opinion over slavery had much to do with the separation of the small group from the parent church. It might also appear that Brother William Siter, after his conversion not only ceased to labor on Sundays, as told in our earlier accounts, but also turned from pro-slavery to anti-slavery. 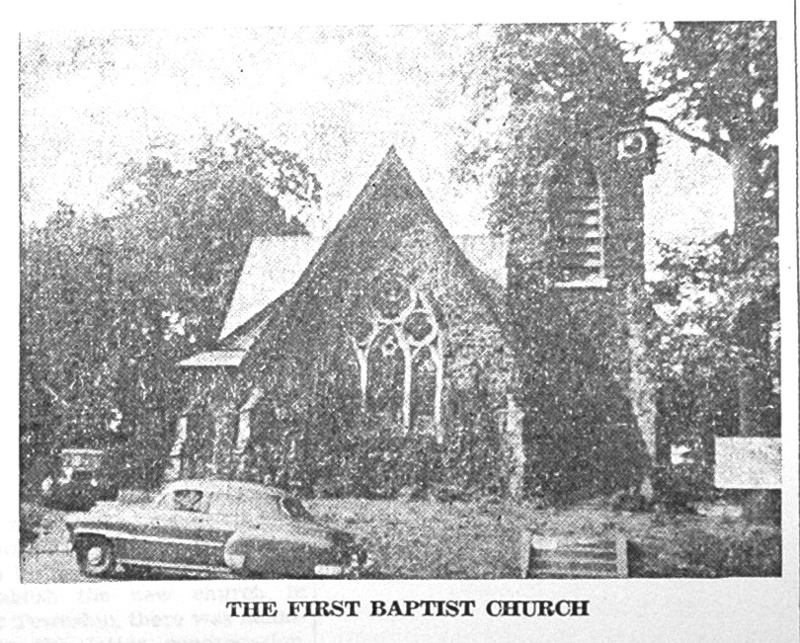 For he might easily have been the “scoffer” who afterwards was “active in getting up this building”, since his name more than any other is prominent in the early annals of this building up of the first small Radnor Baptist Church. The signing of the petition on February 6, 1841, by 79 members of the Great Valley Baptist Church for dismissal from that church in order that these members might form a new church of their own in the vicinity of Carr’s Corners in Radnor township, was the first formal step toward that end. Before the new congregation was really established in the small building that had once been known as Music Fund Hall, many meetings had to be held and much business had to the transacted. Some of these meetings were held in the old Carr’s Corner schoolhouse, while many others were held in the home of Brother William Siter. This was probably the old Siter homestead which once stood on the site of Herman Lengel’s present home at 250 Conestoga road. This order of exercise consisted of singing, reading of the Scriptures, prayer, the sermon, the “Right Hand of Fellowship,” the “Constituting Prayer,” charge to the church, address to the congregation and the benediction. Brethren George Phillips, Zimmerman Supplee and William Siter were appointed at the April meeting to inform Brother Hobart of the call and “to confer with hi on terms.” The three reported back at a somewhat later date that these terms would be “three hundred dollars and expenses to and from the city.” Although the congregation voted unanimously to accept Brother Hobart, they added that when the committee of deacons waited on him they were “to prevail on him if it could be, to lower the terms.” Brother Hobart must have proven most acceptable to his congregation, for by the following year he had the temerity to ask for a salary of $400! Brother Adam Siter was elected sexton of the church, “with the understanding that a collection would be taken up for him every quarter.” A later note in the record book shows that the first collection amounted to $7.57. Brother George W. Lewis was appointed church clerk and he was “directed to procure a blank book in which to record the proceedings of the church.” This is undoubtedly the book which is now before your columnist as she writes. Its pages are frail with 100 years of existence, their one-time white surface brown and stained, their edges soft and crumbling, yet the record of those early days of the church, written in a fine, regular hand, are almost as legible as when they were penned by Mr. Lewis. Other business to come before the spring meetings were the appointment of a building committee “for altering the house,” to consider the building of a school house, and to acquire ground for horse sheds and a graveyard. The board of trustees reported that they had obtained this additional portion of ground from brother William Siter at the approximate price of $760 which, in addition to the original price of $700 for Music Fund Hall, brought the total purchase price to $1,460. However, “the additional purchase bro. Siter was willing to relinquish for the sum of one dollar, which added to 700 dols. 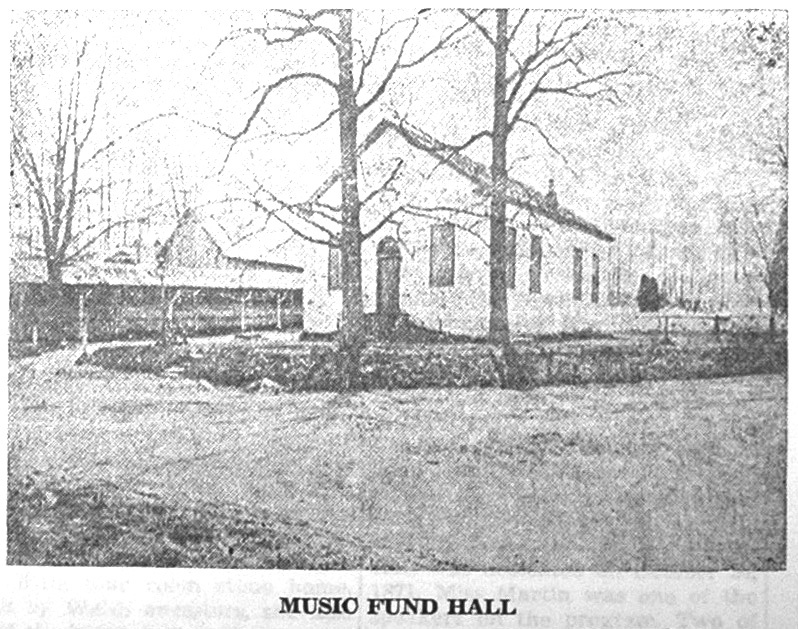 the sum to be paid for the first purchase, amounted to $701.” However, bills for repairs on Music Fund Hall amounted to $245.43, and as the total amount for subscriptions from church members amounted to only $383 to date, “the debt against the church” was $563.43. Other urgent matters in the first months of the new church’s existence, in addition to financial ones, were the decision in regard to the form of the charter to be forwarded to the State Legislature, “praying for an act of incorporation” and steps to be taken in regard “to offering themselves for union with the Central Union Association.” Eventually, both charter and membership in the association were obtained. Another matter of business was to have the church insured in the Mutual Insurance Company of Chester County. The William Siter whose conversion to the strict precepts of the Baptist faith from his former more wordly ways of thinking, and who was in a large measure responsible for the founding of the Radnor Baptist Church, belonged to a family whose name has appeared more often that any other in the early history of Radnor Township as it has been sketched in this column. In 1791 his grandfather, Adam Siter, ran the first small Spread Eagle Inn on the old Lancaster Turnpike. Later two other Siters, John and Edward, were in turn associated with the second and much large Spread Eagle Inn. The beautiful Siter farm covered much of what is now South Wayne. Part of the land around Martin’s Dam was once owned by this same family. Mrs. Emily Siter Wellcome tells us that the family was one of the early Welsh settlers to whom William Penn gave a grant of land in what was later to become Radnor township. The original part of the house where she now lives at 415 West Wayne avenue with her daughter, Rosita Wellcome and her brother, George Siter, was probably built in the late 1600’s. Like the other Welsh houses of that period, of which there are a number still remaining in the township, the Siter house was built of stone, with two rooms downstairs and two rooms upstairs. The thicknesses of the old stone wall of Mrs. Wellcome’s living room gave evidence of the age of the house. Somewhat puzzling to us at first was the present outside appearance of the house, stince it so closely resembles certain of the Wayne Estate houses. The explanation seems to lie in the fact that it was remodeled in 1890 by Mrs. William Siter, Mrs. Wellcome’s mother. it was at this time that large numbers of Wayne Estate houses were in the process of construction, and it seems quite possible that Mrs. Siter patterned her home after one of the popular type of that era. At the same time that she enlarged the little four room stone home, built by Welsh ancestors, she also built the house just to the west of her that is now occupied by William M. Zimmermann, Jr., and his family, and which for many years was occupied by the late Eber Siter and his family. According to the old volume of “Genealogical and Personal Memoirs of Chester and Delaware Counties”, lent to us by Mrs. Wellcome, Adam Siter, that first early proprietor of the little old Spread Eagle Inn had several children, among them William, who married Mary Taylor. There were six children born to this union. David, the eldest, “kept store for some time at the Old Eagle house on Lancaster turnpike”, in a section that was known for some time as “Sitersville”, even on the post office records. “John married and settled in Radnor township near the village, of Ithan, where he followed farming” according to the old genealogical records. “Adam and William, the twin brothers (born December 8, 1798) received, under their father’s will, a tract of land containing 192 acres where South Wayne now stands, and here they conducted farming.” After Adam married, he sold his interest to William, who continued the cultivation of the farm and the old Siter saw and grist mill, which stood upon the property. William married Emily Worthington, a daughter of Eber Worthington, of West Chester. The twin brother, Adam, married Margaret Brooke, while one sister, Anna, became the wife of Enoch Davis and the other, Elizabeth, married John Yocum. The William Siter who owned so much of what is now South Wayne was the same William Siter who, with is wife, the former Emily Worthington, was the leading spirit in the founding of the Radnor Baptist Church. Their son, another William Siter, married Sarah Martin, daughter of Richard and Hannah Moore Martin, both of English birth. Sarah Martin is the Miss Sallie Martin referred to in a number of articles in this column as the teacher of the Wayne Lyceum School and also as one of the editors of the “Weekly Gazette”, that early Wayne paper published in 1871-72. When the Wayne Lyceum Hall was dedicated on October 24, 1871, Miss Martin was one of the speakers on the program. Two of the children of these William Siters, George Siter and Emily Siter Wellcome, are among the four living trustees of the old Baptist Church who negotiated its present sale. Seventy-nine persons signed the petition presented at a special meeting of the Great Valley Church on February 6, 1941, for letters of dismissal “for the purpose of constituting a Church at Radnor Hall, which on motion was granted,” to quote the exact wording of church records, now over 100 years old. Written in ink, these records and signatures are still so clearly legible that there can be doubt about only one or two of the signatures. They are names of families who had much to do with Radnor township in its early days. Descendents of some of them are still living here. The “written request” was signed by George Joseph, Samuel, Sarah, Elizabeth, Alice and Susanna Lewis; Christian, Margaret, Sarah Jane, Mary Ann and Elizabeth Miller; William, Louisa, John, George, Mary Hughes, Elizabeth, Peter and Zimmermann Supplee; Mahlon, John, Elizabeth, Elijah, John, Jr. and Hannah Wilds; William, Lucy, Emily, Mary Ann, Sarah and Adam Siter; Charles and Sarah Ann Stout; Thomas and Ann Petty; Jacob, Eliza and Mary Huzzard; Samuel, George, Ann, Mary, and George, Jr., Bittle; Merriam, Hannah and Joseph Hunter; Mary Ann and Sarah Bowman; Jane and Mary Ann Smallwood; Samuel and Emma Crew; John and Elizabeth Aikens; George and Hannah Phillips; Margaret and Abraham Richardson; Jacob Wismer, Jacob Taylor, Ann Hampton, James Carr, Jr., Elizabeth Meredith, Mary Ann McKnight, Mary Marion Loveat, George Murry, Samuel Hanson, Nancy Davis, Mary Rulong, Isaac Millenn, Benjamin Snively, Theodosia Riddle. 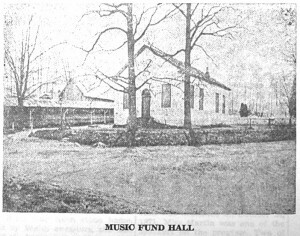 Music Fund Hall, the small building shown in the picture illustrating the column this week, was built “some time in or about the year 1832” by “a band of unbelievers in the neighborhood round about.” This neighborhood was then known as Carr’s Corner, now the intersection of Conestoga road and West Wayne avenue. 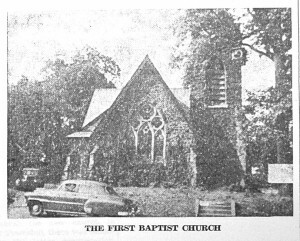 The picture plainly shows that Music Fund Hall once stood on the exact location of the First Baptist Church, now in process of demolition. The building to the right in the picture was built before Music Fund Hall. Known as the first school in the township, its outside appearance has been little altered by the passing years. During the period when, as described in last week’s column, “there was a deep religious feeling pervading this portion of the Master’s Vineyard,” there is evidence also that this feeling was by no means all-pervading. While “the prayer circle and the conference room were the delight” of some, there were others who were more worldly-minded. For, whether in a spirit of perversity or because it seemed a suitable location, it was on a piece of ground immediately adjoining the old school house that the “band of unbelievers in the neighborhood” chose to erect a building of their own planning. It was to be one “where gatherings could be had, and of such a character as would draw away the minds of the young from the serious, and thus weaken and eventually overcome the growing religious feeling,” to quote from the old church records. And “among the foremost in this scheme was Mr. William Siter,” the man who a few years later was to become one of the first four deacons of that early Baptist Church and up to the time of his death always one of its strongest supporters. “The concert was a failure,” is a brief summary in the church account. Whether the “band of unbelievers” tried entertainments in any other form is not recorded. Perhaps they were too discouraged by the failure of their first attempt. At any rate, when a little later “the band” tried to get a title, their plans met with their final setback. For Mrs. Siter refused her name to the title deed! In 1841 the new interest “paid brother Siter $700 for the building and the ground occupied by the Music Fund Hall.” This was after a petition to the Great Valley Baptist Church had been circulated and signed by some 61 people living in the vicinity of Carr’s Corner. In the petition, request was made for the “construction of a new church.” Once letters had been granted by the Great Valley Church to the persons named in the petition, plans for the meeting place for the new congregation grew rapidly. Certain alterations were made at a price of $246, increasing the total cost of the newly acquired building to $946. Later on in this same year, that of 1841, the new church built a school house at a cost of “about $300.” As time went by there were other improvements, including horse and buggy sheds, a vault, a parsonage and a stable. This brought the total expenditure up to what seems now the more than modest figure of $2840. By the time the church celebrated its 40th anniversary in 1881, the total expenditure for the church property had grown to $3946, as shown in the report given at that time. Improvements in the interior had included the remodeling of the small church and of the school house. It probably remained without further changes for the next nine years, when in 1890 the large stone edifice that supplanted it was built.